BANGKOK Oil markets are taking the death of Venezuelan President Hugo Chavez in stride, with the price of crude little changed Wednesday. 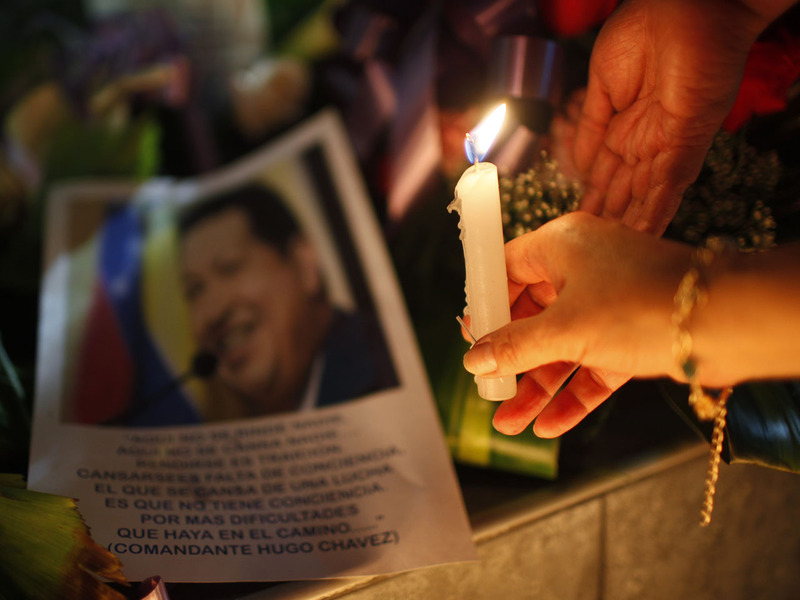 Chavez, who died Tuesday after a two-year battle with cancer, oversaw a decline in oil production during his 14 years as the leader of Venezuela, and analysts don't expect that trend to change immediately. The full impact of his death may not be felt until Venezuela, which sits on the world's second-largest oil reserves, picks a new leader -- one who might choose a course different from Chavez. The existence of ample global oil supplies kept markets at ease. Benchmark oil for April delivery was down 8 cents to $90.74 per barrel at late afternoon Bangkok time in electronic trading on the New York Mercantile Exchange. "Problems in Venezuela will undoubtedly impact the market, but may not be too much of a problem for the market to cope with," said Ric Spooner, chief market analyst at CMC Markets in Sydney. "It is well supplied and it still has reasonably high prices in relation to the current demand-supply balance." On Tuesday, the contract rose 70 cents to finish at $90.82 a barrel on the Nymex, just hours after Chavez died. Brent crude, used to price many kinds of oil imported by U.S. refineries, fell 24 cents to $111.37 a barrel on the ICE Futures exchange in London. Energy historian Daniel Yergin said in an emailed statement Tuesday that it was a plunge in oil prices and the resulting discontent in Venezuela that gave Chavez the opening to win election in December 1998. Rising prices then helped him consolidate power by allowing him to fund popular programs. "It's too soon to say what Hugo Chavez's death means for oil prices, but it is certainly true that oil prices are what made Hugo Chavez possible," Yergin said. But the country's production began to fall soon after Chavez assumed power because he declined to invest in new drilling to replace depleting fields. By 2011 the country's output had dropped 2.5 million barrels a day from 3.5 million barrels per day in 2000, according the Energy Department, and exports had fallen to 1.7 million barrels a day. Oil accounts for 95 percent of Venezuela's export earnings. Venezuela, increased it gross domestic product an average of 2.8 percent between 1999 and 2011, according to International Monetary Fund figures. By that measure, the country was outperformed by every other member of OPEC except Libya. Even war-torn Iraq posted higher growth. Chavez increasingly turned against the United States, although he continued to depend on the U.S. for oil revenue. Oil shipments to the U.S. declined from 49 million barrels a month when Chavez took office, to 31.9 million barrels in February 2011. Citgo Petroleum Corp., the country's U.S.-based oil company, operates three refineries in Texas, Louisiana and Illinois, and sells fuel through thousands of gas stations. Citgo has been used by Chavez to distribute discounted heating oil to poor American families in a high-profile program aimed at criticizing Washington's approach to the needy. Chavez invested Venezuela's oil wealth into social programs including state-run food markets, cash benefits for poor families, free health clinics and education programs. But those gains were meager compared with the spectacular construction projects that oil riches spurred in glittering Middle Eastern cities, including the world's tallest building in Dubai and plans for branches of the Louvre and Guggenheim museums in Abu Dhabi. This week, oil traders will be monitoring fresh information on U.S. supplies of crude and refined products and the latest government data on hiring. The Labor Department will release employment data for February on Friday. - Wholesale gasoline fell 0.9 cents to $3.1388 a gallon. - Heating oil rose 0.3 cent to $2.976 a gallon. - Natural gas rose 1.9 cent to $3.548 per 1,000 cubic feet.